Son Of Pakistani Ex-Premier Kidnapped At Election Rally : The Two-Way Gunmen abducted candidate Ali Haider Gilani during a campaign event in the city of Multan in the latest violence to hit the campaign trail ahead of Saturday's nationwide elections. 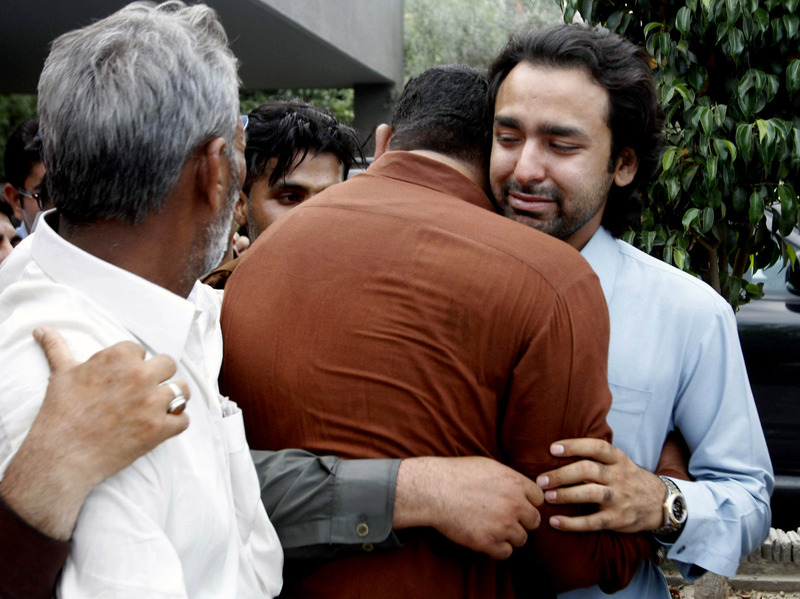 Musa Gilani (right) is comforted on Thursday after his brother, Ali Haider Gilani, was kidnapped at an election rally. Gunmen in Pakistan stormed an election rally and abducted the son of a former prime minister — the latest violence in a bloody campaign ahead of nationwide polling. Armed men drove up to an election rally in the city of Multan, opened fire, grabbed Ali Haider Gilani and sped off, witnesses said. Gilani, who is running for a seat in the Punjab provincial assembly, is the son of former Prime Minister Yousaf Raza Gilani. It was unclear whether the candidate was wounded in the attack. Witnesses reported that he was dragged bloody to the kidnappers' vehicle. At least one member of Gilani's entourage was killed in the attack. The Gilani family has deep roots in the Pakistan Peoples Party of President Asif Ali Zardari and former Prime Minister Benazir Bhutto, who was assassinated in 2007. No group has claimed responsibility for the attack on Thursday, the last day of campaigning ahead of Saturday's nationwide elections. However, The Guardian newspaper quotes members of the Gilani family as saying they have gotten death threats from the Taliban and, despite appeals to police, have not received adequate security. "Kidnapping is a tactic frequently used by militants and criminal groups across Pakistan. Ransom is an important revenue stream for the Pakistani Taliban and hostages can be used as bargaining chips in negotiations with the authorities ... "
The election campaign has been marred by violent attacks against candidates, much of it at the hands of the [Pakistani] Taliban, "who have mainly targeted political parties that have supported military operations against [the group] in northwestern Pakistan," The Associated Press says. In a country with a history of military coups and political intrigue, Saturday's elections are considered historic — they would mark the first time that one civilian government has completed its term and prepared to hand off power to another.